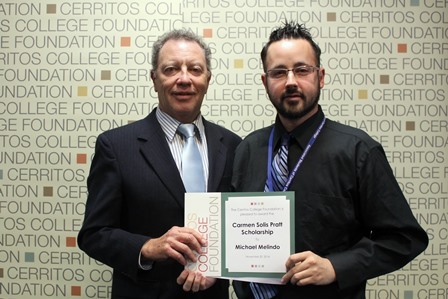 NORWALK, Calif. – December 8, 2014 – Retired Norwalk Superior Court Judge Dan Pratt recently presented Michael Melindo of Lakewood with the $1,800 Carmen Solis Pratt Scholarship at the Cerritos College Foundation’s board meeting. Judge Pratt established the Carmen Solis Pratt Re-Entry Scholarship in 2001 in memory of his mother who valued education, but was never able to attend college herself. Melindo is a first-year student enrolled in the nursing program. He developed an interest in the medical field as a teenager and is excited to be pursuing his goals at Cerritos College. Melindo loves connecting with patients and being able to provide quality care. Once he earns his associate’s degree, Michael plans to transfer to California State University, Long Beach for his bachelor’s degree in nursing. “Michael was selected as the recipient because he reflects my mother’s sense of initiative and drive and I am certain he’ll accomplish his educational goals,” said Pratt.